WHAT DOES POES BLACK CAT SYMBOLIZE? Poe seems to have made the safe assumption that his use of the name Pluto would be seen with the cyclopean eye of his readers as a casual reference to the resting place of the dead, and some of the bragging of his narrators’ just may be an expression of his own pride in so well concealing, while at the same time expressing, his true feelings toward his wealth-giver, the reading public. When the narrator of “Tell-Tale” says, “in the wild audacity of my perfect triumph, [I] placed my own seat upon the very spot beneath which reposed the corpse of the victim” (320), only the befuddled psychoanalyst can keep at bay the suspicion aroused by what is commonly read as an instantaneous transition from pride into a state of overwhelming guilt. The beating of the heart that prompts the confession is really a continuation of the terror excited by the old man’s one-eyed glare; no matter what Poe does with his writing, only the fear-inducing aspects are ever appreciated. Since the old man is an earlier version of Pluto, the tale itself represents the author’s confession of his true ambivalence toward his readers. And why did he make such a confession? “Anything was more tolerable than this derision!” he says. “I could bear those hypocritical smiles no longer!” (320) But the confession went unheard, drowned out by the terrified beating of readers’ hearts. It is even possible that “Black Cat,” “Imp,” and “Amontillado” represent continued, escalated flirtations with being found out. The victim of “Imp” is nothing but a reader with money. And the murderer of Fortunato—note the name—though confessing in the tale, ends by bragging about escaping detection for “half of a century” (421); three years after he began playing this game, Poe was probably less and less worried that anyone would catch him at it. But it is in “Black Cat” that the allegory—or coded message—is the most developed. One level is what Griffith calls the “Gothic overplot,” another level is the ironic one identified by Gargano, and yet another level, a duplicitous or coded one—the “satiric underside”—seems to be signaled by recurring elements between this and other tales, like a focus on eyes, and perversity, as well as by the dual meanings of the cat’s name. This multi-dimensionality is keeping with Poe’s ideas of the Arabesque, a term which appeared in the title of an earlier collection of his tales. As Thompson explains, “Islamic tradition discourages the artistic reproduction of any natural forms that may be said to possess a soul,” and to avoid such forms artists in this tradition rely on “almost purely geometrical forms” such as the elaborate designs seen in Arabesque architecture and textiles. One of the primary characteristics of these designs is that each patterned is inlaid and interweaved with several others so that the overall image is intricate and multidimensional. Thompson also points out that Poe, following the influence of German theorist Friedrich von Schlegel, applied the same principle to his conception of Romantic Irony, “which is neither just parodic or serious but both simultaneously, as in Cervantes’s Don Quixote and the plays of Shakespeare” (79). It appears, however, that Poe added yet another layer to this design. And this is how he solved the dilemma historian Jill Lepore describes thus: “he needed to turn his pen to profit, but he also wanted to signal…that he was lowering himself” (68). This statement could of course be read as another application of the Gothic trope of having the unreliably hysterical narrator reference the possibility of his own madness in order to make his ravings more credible. “I neither expect nor solicit belief,” (348) he says in the first sentence—because he would have to be crazy to, the implication runs. But, with Gargano’s evidence in mind of Poe’s deliberate use of the double voice, one the author’s and one the narrator’s, along with Griffith’s discovery of a “satiric underside” concealed by the “Gothic overplot” elsewhere in Poe’s work, and especially in light of the dual meanings of the cat’s name, another reading suggests itself: Poe is taunting his readers to catch him disparaging them. It is noteworthy that the narrator himself is responsible for the half-blindness of the cat, since this was not the case with the old man in “Tell-Tale.” Before getting to the disoculation, though, the narrator describes a childhood surrounded by pets, even to the exclusion of human companions. “There is something in the unselfish and self-sacrificing love of a brute,” he writes, “which goes directly to the heart of him who has had frequent occasion to test the paltry friendship and gossamer fidelity of mere Man” (349). The man Poe, ever frustrated by those on whom he depended for anything, must have taken great pleasure in the complete dependence and obedience of animals. But then cats are much less obedient than dogs. In terms of his career, this early period represents his naïve and romantic youth, before maturity complicated his ideas and feelings toward his art. All that was to change when, with his own pen, he made himself into something more complex than a writer of romantic poetry. His writing was to take on a satiric edge, not that his readers ever really caught on to the difference. 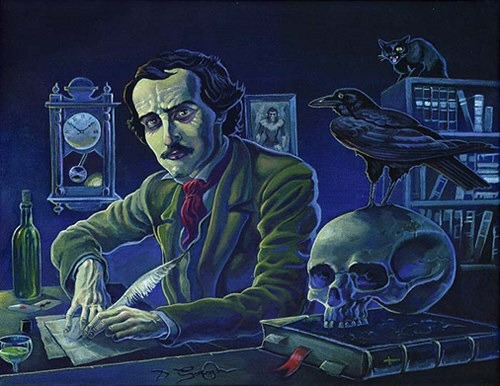 Really at this point in the story, though, there is more Gothic plot than coded satire, and the equation of the narrator’s love of animals with Poe’s early romantic writing is no less tenuous than countless other allegorical readings. But when the narrator, in the grip of perversity, goes beyond the initial injury and kills Pluto, things get more interesting. The Imp of the Perverse compelled the narrator of that tale not to murder his victim but to confess it, but in “Black Cat” perversity is responsible for the eponymous cat’s demise. “Imp,” published two years later, may have been referring to the symbolic violence done to the reader of the earlier tale. Since the perpetrator had gone undetected for so long, the Imp, a self-destructive force, had proven itself not to have been in play. Poe suffered no consequences for loosing “Black Cat” on his audiences. But he did suffer from his strained relationships with those who served as an intermediary between him and his readers, editors like White and Graham. In another apparent contradiction, the narrator of “Black Cat” claims, “It was this unfathomable longing of the soul to vex itself—to offer violence to its own nature—to do wrong for the wrong’s sake only—that urged me continue and finally to consummate the injury I had inflicted upon the unoffending brute” (350). Whom is he hurting when he hurts the cat? The answer comes in the next paragraph: “On the night of the day on which this cruel deed was done, I was aroused from sleep by the cry of fire… The whole house was blazing” (351). Having given in to his frustration with his wealth-giver, the narrator subsequently, immediately, loses his home. For those who missed this not-so-subtle point, he adds a few lines later, “My entire worldly wealth was swallowed up” (351). Just as White failed to detect the parody in “Berenice,” Poe could always count on at least a preponderance of his readers at large to miss any satire he concealed in his work. And so, despite the violence done to it, the black cat returns—Poe continues to make money by writing scary stories. But because he was in more dire economic straits at this time in his life, owing largely to his falling out with Graham, the cat returns sporting an ominous sign: “the GALLOWS!”(353) delineated by a tuft of white fur. The narrator brings this second cat home, where it “became immediately a great favorite with my wife” (352). But he says, “I soon found a dislike to it arising with me…its evident fondness for myself rather disgusted and annoyed” (352). Oddly, it is not until the paragraph following this admission of his dislike, that he mentions what would seem to be its most remarkable feature: “like Pluto, it also had been deprived of one of its eyes” (352). Of course, Poe continued to hate the admiration of his half-blind readers, even though it was helping him support his wife. The narrator admits that he “longed to destroy” (352) Pluto, but was dissuaded from doing so “by absolute dread of the beast” (353), which he attributes to the image in the cat’s fur. Forced to coexist with this object of dread, he wrestles with the irony of how he “a man, fashioned in the image of High God,” was being made “wretched beyond the wretchedness of mere Humanity” by “a brute beast—whose fellow I had contemptuously destroyed” (353), a line which clearly equates perversity with contempt. The uneasy cohabitation persists until his wife, “the most patient of sufferers,” accompanies him, “upon some household errand, into the cellar of the old building which our poverty compelled us to inhabit” (353). The cat rushes in to trip him, causing him to forget his dread and take up an ax, which when his wife tries to stop him from using, ends up in her brain. His rage for the cat gets turned on his wife. Since the cat is the “wealth-giver,” the image springs direfully to mind of Virginia shivering in her unheated room with nothing but a coat and a cat to keep her warm. At this point, the story becomes, like the others in the nexus, a case of self-destructive boasting. After walling up his wife, he says “I looked around triumphantly, and said to myself—‘Here at least, then, my labor has not been in vain’” (354). When police arrive to investigate her disappearance, he shows them to the cellar and the basement—“Secure… in the inscrutability of my place of concealment” (355). Once they have had a look around and are making to leave, the narrator calls them back. “The glee at my heart” he says, “was too strong to be restrained. I burned to say if but one word, by way of triumph, and to render doubly sure their assurance of my guiltlessness” (355). He starts boasting about how his is “an excellently well constructed house,” and “through the mere phrenzy of bravado” (355), he raps with his cane on the wall concealing his wife’s body. Just as in “Tell-Tale” and “Imp,” the narrator is responsible for the discovery of his own crime. Pluto, inadvertently walled up with his wife, aroused by the tapping, sounds a cry “half of horror and half of triumph,” so that the wall is torn down and it is revealed, perched atop his dead wife’s head, looking out with its “solitary eye of fire” (355). What is most impressive about Poe’s coded attacks on his readers is that the stories concealing them are so good that even critics with a sophisticated awareness of his multileveled satires have found no reason to see them as anything but superbly crafted Gothic tales. This excellence, which he achieved despite his contempt for those who appreciated the genre, is itself yet another form of defiance. Poe must have determined that if he had to write overwrought, hysterical tales of murder and madness to be read, he would just have to show everyone how it was done. He would take it to the next level—and do so in the same stories into which he was weaving his codes. Harold Bloom, straining to find something positive to say about Poe, writes that he “authentically frightens children, and the fright can be a kind of trauma,” and his own reading of the author as a child “induced nasty and repetitious nightmares that linger even now” (3). Bloom is just the kind of authority Poe would have detested, and he would have been delighted to hear to that he managed to give the critic, who hasn’t even caught on to the topmost layer of his layers-deep satire, nightmares into adulthood. Still, his laugh would have to be tempered by the tragedy that he never did get his chance to write what he wanted to write without the specter of poverty looming over him. WHAT DOES POE'S BLACK CAT SYMBOLIZE? To contextualize the writing of “Black Cat” biographically, two events are of interest. In January of 1842, Poe’s wife, Virginia, damaged a blood vessel while singing, and this was but the beginning of her decline in health brought about by tuberculosis. Her condition was quite likely exacerbated by their poverty; one of Poe’s letters from the time describes how all Virginia had to guard her from the winter cold was his greatcoat used as a blanket, atop of which perched a tortoiseshell cat to keep her chest warm. Despite his money troubles, though, Poe resigned his editorship of Graham’s Magazine after a power struggle with George Graham. Subsequently, he was forced to cast about desperately for editors and publishers for his work (Thompson xxxiii-iv). Tellingly, though, before the falling out, Poe seems to have discovered a fondness for cryptograms. He even tried to get hired by the government to write them. About a year before leaving Graham’s, he published an essay on “secret writing,” which he described as writing “in such a manner as to elude general comprehension” (Lepore 69). The story introduces “the spirit of PERVERSNESS,” which Poe revisited in a later tale, to account for these “unmotivated and seemingly unresisted acts.” But there is no other reference to any philosophical school or literary tradition. And there are no physical descriptions of the characters. The only character who is really represented in any detail is the narrator, leaving readers to wonder who he is, if they should take him at his word when he recounts his tale, and what they should make of this invoking of perversity as a clue to his motive. Citing Piacentino as an example of misguided psychologizing, Joseph Stark works to place the story in its historical context and suggests that such “analyses…may indicate in their very strivings to provide answers that no sufficiently clear cause for the narrator’s murder of his wife and the cat may be found in the text” (255). Of course, the story states this much explicitly, but what Stark argues would have been disturbing about this taking the narrator at his word is that it “posed significant challenges to increasingly influential scientific thought as well as to shifting evangelical theology” (255). These critics’ points may be valid, but they apply only insofar as the story is taken at face value. Originally published in August of 1843, “The Black Cat” forms a nexus with three other tales, “The Tell-Tale Heart” published seven months earlier, “The Imp of the Perverse” from July 1845, and “The Cask of Amontillado” from November 1846. Since the plot of “Black Cat” bears strong similarities to both “Tell-Tale” and “Amontillado,” centering on the murder and immuring of victims and narrated by men at the mercy of confessional compulsions, it may be helpful in uncovering any deliberately concealed satire to pursue a strategy similar to Griffith’s intertextual approach to “Ligeia.” The first notable detail arising from this comparison is the emphasis on the eyes of the victims in both “Tell-Tale” and “Black Cat,” as well as the narrator’s denial of ill-feeling toward them. “I loved the old man,” he says of the victim in “Tell-Tale,” but he was nonetheless driven to murder by one of the old man’s eyes. “He had the eye of a vulture,” the narrator says, “a pale blue eye, with a film over it” (317). The victim in “Amontillado” is also described at one point as looking into the narrator’s eyes “with two filmy orbs” (417), but in this case the eyes are not integral to the plot, whereas in “Tell-Tale” the narrator ends up postponing the violence until the eighth night because in attempting to kill the old man in his sleep he keeps finding him with the offending eye closed. In “Black Cat,” eyes come into play in the first incident the narrator describes. Returning home drunk, he suspects the hitherto affectionate cat is avoiding him. So, he chases it down, and then he says, “I took from my waistcoat-pocket a pen-knife, opened it, grasped the poor beast by the throat, and deliberately cut one of its eyes from the socket!” (350) Since only one of the old man’s eyes in “Tell-Tale” is ever mentioned, it seems the violence in these stories has something to do with the victims being one-eyed. Poe does something interesting, too, in the line following the narrator’s description of the abuse of his pet: the narrator says, “I blush, I burn, I shudder, while I pen the damnable atrocity” (350). It is as if Poe were drawing readers’ attention to the violent implement’s similarity to a pen. 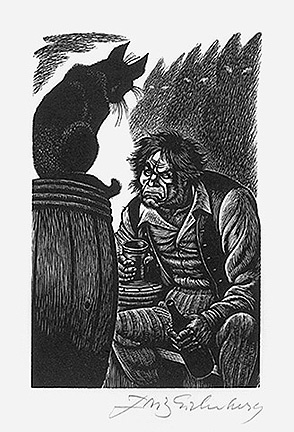 The now one-eyed cat goes on to foment the narrator’s rage, much the way the old man’s eye in “Tell-Tale” does, only in the case of “Black Cat” that rage gets turned onto the narrator’s wife. The victim in “Amontillado” keeps both his eyes unto death, but the narrator’s motive for killing him is never in question because he states it in the opening lines. “The thousand injuries of Fortunato,” he says, “I had borne as best I could, but when he ventured upon insult I vowed revenge” (415). The nature of the insult remains a mystery throughout the tale, but Fortunato is presented as a proud, pretentious buffoon. “You are rich,” the narrator says to him to coax him into the trap, “respected, admired, beloved; you are happy, as I once was” (417). This exploitation of Fortunato’s pride, along with the vague reference to the narrator’s fallen status, persists until the end. The victim in “Amontillado” closely resembles many of the high-status targets of Poe’s satires. But what is important about him in the context of “Black Cat” and the two other tales linked to it is that Poe gives him a name. Neither the old man in “Tell-Tale” nor the wife in “Black Cat” nor the victim in “The Imp of the Perverse” has a name. In fact, the only details given about this last character are that he had a “habit of reading in bed” (405) and that he had an estate large enough to tempt the narrator to murder so that he might inherit it. But there is another victim in these stories whom Poe did deign to give a name, and that is the black cat himself, Pluto. There remains, however, another major intertextual element to examine before considering the possible significance of the cat’s name, and that is “the spirit of PERVERSENESS” (350), as it is referred to in “Black Cat,” and The Imp of the Perverse, which gives the later story its title. “Imp” begins with a lengthy philosophical discussion on what the narrator calls the “overwhelming tendency to do wrong for the wrong’s sake” (403). The narrator in “Black Cat” defines it as the “unfathomable longing of the soul to vex itself—to offer violence to its own nature—to do wrong for the wrong’s sake only” (350). Early in “Imp,” the narrator is at pains to distinguish between perverseness and “the Combativeness of Phrenology,” by asserting that while “Combativeness has for its essence the necessity of self-defense,” when perversity is in play “the desire to be well is not only not aroused, but a strongly antagonistical sentiment prevails” (403). However, later in the story, the same narrator concedes that perversity is “occasionally known to operate in furtherance of good” (405). A plethora of examples from Poe’s own biography suggests themselves as illustrations of an impulse akin to combativeness but with an element of self-destructiveness. There is much of pride in Poe’s perversity, but more of defiance. “Imp” is not about a conflict with a superior, though, but rather a well planned and executed murder the culprit would have escaped all suspicion for had he not been overtaken by the mysterious impulse to confess. It’s important to note that perversity does not push the narrator to murder; it compels him to tell everyone he did it. And he states explicitly that the confession is prompted by perversity, not any attack of conscience. Is he really confessing, or is he taking credit, demanding recognition, boasting about his perfect crime? The murder complete, he goes on to boast some more about “the wise precautions” he takes in hiding the body. “I… replaced the boards so cleverly,” he says, “so cunningly, that no human eye—not even his—could have detected any thing wrong” (319-20). In fact, except for “Black Cat,” all the stories in this nexus are really extended boasts. But what was it about that old man’s eye that provoked the narrator to kill him? Could it be the same thing that drove the narrator in the later tale to kill his cat? This chafing under authority manifested itself in Poe’s reviews of the more successful of contemporary writers as well. He once wrote, “The most ‘popular,’ the most ‘successful’ writers among us (for a brief period at least) are, ninety-nine times out of a hundred, persons of mere address, perseverance, effrontery—in a word, busy-bodies, toadies, quacks” (quoted in Lepore 68). This formulation is the crux of Poe’s dilemma, as he was forced to balance his need to sell his work with his urge to demonstrate his genius. One of the ways he tried to do so was to criticize the dominant literary tradition of the day. In this endeavor too, he went to excess. His attacks on what were known as the New England Brahmins, Transcendentalists like Ralph Waldo Emerson, were legendary, especially those against William Wadsworth Longfellow, which he referred to as his “Little Longfellow War.” His reviews showed such a pronounced tendency toward vitriol that was nicknamed “tomahawk man” by his fellow reviewers (Thompson xxviii). At the same time, he routinely quarreled with the editors of the magazines who employed him and published these reviews because he insisted on “total authority” and “complete editorial control” (Thompson xxxii). His ultimate goal, which was never realized, was to publish his own magazine. So it appears that Poe’s idea of acknowledging a literary debt entailed publicly accusing his inspiration of plagiarism—but leaving clues in the accusation that would lead careful investigators to the truth. The creator of the detective genre certainly enjoyed leaving this kind of trail. Poe did at times go after those in positions of power in straightforward and self-contained satirical stories. Indeed, Stephen Mooney, a critic who specializes in Poe’s comedy, points out defiance plays as a much of role in what Poe found funny in his stories as it did elsewhere in his life. Mooney writes that Poe’s humor “is directed toward the exposure of a society in which heroes and rulers are shown to be deluded or irresponsible and their subjects a dehumanized, sycophantic mass” (433). Mr. Blackwood and Signora Psyche Zenobia are a case in point, but there are also the admirer’s of “The Man That Was Used Up,” the revelers and the court in “Hop Frog,” and the asylum staff and its inmates in “The System of Doctor Tarr and Professor Fether.” All of these stories operate on the humor inherent in overturning an unjust or absurd hierarchy. Poe subtly poked fun at real political leaders of his day too, for instance, by giving the devil the features of Martin Van Buren in “The Devil in the Belfry” (Whipple 88). Most interesting, though, are the humorous attacks Poe concealed by weaving them as threads into otherwise serious tales. Clark Griffith, for example, finds in “Ligeia,” “an allegory of terror almost perfectly co-ordinated with the subtlest of allegorized jests” (17). One of the authorities Poe defies in the story is obviously death itself. Death and time are challenged in similar ways in many of his tales—including, farcically, in “A Predicament.” But Griffith suggests that the Lady Ligeia “symbolizes…the very incarnation of German idealism, German Transcendentalism provided with an allegorical form” (21). The other lady of the story, Rowena Trevanion, symbolizes English Romanticism “‘unspiritualized’ by German cant” (24). Here too Poe is making fun of the dominant literary traditions of his day. But, as Regan points out, Griffith discovered the nature of this “Gothic overplot with [a] satiric underside” (17) only when he used keys found in other stories published around the same time, “Siope” (or “Silence” as it was later renamed) and “How to Write a Blackwood Article,” with its overt references to Romanticism and Transcendentalism. But what Regan believes is most impressive about the subtle satire in “Ligeia” is that the “‘underside’ is of a remarkably deceptive kind, since failing to take account of it in no way damages the self-consistent ‘Gothic overplot’” (294). Poe does such an excellent job manipulating the genre beloved by the reading masses that the symbolic violence his tales perpetrate is seldom noticed. Such is the case with “The Black Cat,” in which that violence is directed at those reading masses themselves. Critic James W. Gargano sees in this story evidence that Poe, instead of betraying his own neuroses in his writing, very deliberately clues in readers to the unreliability of his narrators, insisting that a “close analysis of ‘The Black Cat’ must certainly exonerate Poe of the charge of merely sensational writing” (829). Gargano goes on to defend Poe against criticism like Bloom’s and Oates’s that his style was overwrought, which is “based, ultimately, on the untenable and often unanalyzed assumption that Poe and his narrator’s are identical literary twins and that he must be held responsible for all their wild or perfervid utterances” (824). Though Gargano is right that Poe is up to something deliberate with his bouts of breathless hysteria, he overlooks the many instances in which Poe encourages readers to look for him in his stories. For instance, William Wilson’s birthday is given as January 19th, Poe’s own birthday. The captain of the ship in “Ms. Found in a Bottle” is precisely the same height as the author and has the same eye color. And the protagonist of “The Narrative of Arthur Gordon Pym” has a name similar enough to Edgar Allan Poe’s to have caused some confusion regarding the fictional status of the tale when it was first published (Wilbur 808). Modern writers and critics are never quite sure what to make of Edgar Allan Poe. Aldous Huxley famously described Poe’s verse lines as the equivalent of “the wearing of a diamond ring on every finger,” and the popular critic Harold Bloom extends the indictment to Poe’s prose, writing “Poe's awful diction… seems to demand the decent masking of a competent French translation” (2). What accounts for the stories continuing impact, Bloom suggests, are “the psychological dynamics and mythic reverberations of his stories” (3). Joyce Carol Oates, who of all contemporary writers might be expected to show Poe some sympathy, seems to agree with Bloom, charging that Poe’s stories are “hampered by… writerly turgidity” but nonetheless work on readers’ minds through his expert use of “surreal dream-images” (91). What these critics fail to realize is that when Poe went to excess in his prose he was doing it quite deliberately. He liked to use his stories to play games with his readers, simultaneously courting them, so that he could make a living, and signaling to them—at least the brightest and most attentive of them—that his mind was too good for the genre he was writing in, his tastes too sophisticated. The obliviousness of critics like Bloom notwithstanding, most Poe scholars are well aware that his writing was often intended as a satire on popular works of his day that showed the same poor tastes and the same tendency toward excess which readers today mistake as his own failures of eloquence. Indeed, some scholars have detected satiric elements to what are usually taken as Poe’s most serious works in the Gothic Horror genre. Clark Griffith, for instance, sees in the story “Ligeia” evidence of a “satiric underside” to the “Gothic overplot” (17) which arrests the attention of most readers. And, as critic Robert Regan explains, “Poe…was capable of synchronizing a multi-faceted tale of terror with a literary satire,” and he was furthermore “surely… capable of making his satiric point apparent if he had chosen to” (294). To understand what it is Poe is satirizing—and to discover why his satire is often concealed—it is important to read each of his stories not just in the context of his other stories but, because he had a proclivity toward what Regan refers to as duplicity, of his life beyond his work as well. Even a cursory study of his biography reveals a pattern of self-destructive defiance reflective of an incapacity to tolerate being at the slightest disadvantage. Poe, poverty-stricken for most of his adult life, even went so far as to defy the very readers he depended on for his paltry livelihood, but he did so in a manner so clever most of them caught no hint of the sneer. In point of fact, he more than once managed to escape detection for expressions of outright contempt for his readers by encoding them within some of the very tales—“The Tell-Tale Heart,” “The Black Cat,” “The Cask of Amontillado”—they found, and continue to find, most pleasing—and most horrifying. That Poe often wrote what were intended to be straightforward satires or comedies is clear in any comprehensive edition of his work. The story “How to Write a Blackwood Article,” for instance, not only quotes Cervantes, but probably owes its central conceit, a dunderheaded and ambitious writer seeking out the ridiculous, but lucrative, advice of a magazine editor, to the prologue of Part I of Don Quixote, in which the author struggles with the opening of his story until a friend comes along and advises him on how to embellish it (Levine 15). And Thomas Mabbott, a major Poe critic, has found letters in which the author describes a framing scheme for his early stories similar to Chaucer’s Canterbury Tales, in which a group, The Folio Club—“a mere Junto of Dunderheadism,” he calls them in an introduction (595)—takes turns telling stories and then votes to award a prize to the best. Poe writes: “As soon as each tale is read—the other 16 members criticise it in turn—and their criticisms are intended as a burlesque upon criticism generally” (173). The tales themselves, Poe writes, “are of a bizarre and generally whimsical character” (173). Robert Regan takes this evidence of Poe’s comedic intentions a step further, pointing out that when readers responded to “parodies or imitations of the mannered styles of fiction of his day” by giving them “praise for virtues [they] never pretended to,” the author “seems to have decided to make the best of being misunderstood: if his audience would not laugh at his clownishness, he would laugh at theirs” (281). Of course, Poe himself would go on to write a story titled “The Premature Burial,” so his attitude toward this type of writing was more complicated than Juniper’s authorship would suggest. Indeed, the story Signora Psyche Zenobia writes in the manner advocated by Mr. Blackwood, “A Predicament,” or “The Scythe of Time” as it was originally titled, is not fundamentally different from the style in which Poe wrote his more serious tales. It seems, rather, to have resulted from a cranking up of the exaggeration dial until the burlesque that is elsewhere imperceptible to popular readers comes across as patently ridiculous. And this wasn’t the first time Poe lampooned the overblown prose and farfetched plots of what were called “sensation tales,” like those published in Blackwood’s; three years earlier, with “Berenice,” another tale of premature burial, he tried to mimic these same excesses, but no one, including Thomas White, the editor who published it, caught the joke. In his correspondence with White, Poe gives a sense of what he believed he was working with—and against—in the publishing world of the 1830’s and 40’s. White agreed to publish “Berenice,” in which the protagonist, in the throes of his obsession with a woman’s teeth, removes them from her corpse, only to discover she wasn’t really dead, even though he suspected it was in bad taste. Poe apparently agreed. “The subject is by far too horrible,” he writes, “and I confess that I hesitated in sending it you especially as a specimen of my capabilities” (597). He goes on to claim that he was prompted to write the story by a wager against his ability to compose one on such a horrible subject. Napier Wilt, a critic who considers the question of Poe’s attitude toward his tales, finds this claim “somewhat dubious” (102). But it seems such a bet would have been the very type of challenge to Poe’s genius he could not back down from. And Poe goes on: “The history of all Magazines shows plainly that those which have attained celebrity were indebted for it to articles similar in nature—to Berenice—although, I grant you, far superior in style and execution” (597). That admission of the superiority of others’ work is more dubious by far than that the story was conceived from a bet. Poe then explicates to White precisely how the pieces he refers to, which are responsible for the success of the magazines that publish them, handle their topics. The way he describes them provides a lens through which to view works of his beyond just the one he is defending. The public, he writes, likes works consisting in “the ludicrous heightened into the grotesque: the fearful coloured into the horrible: the witty exaggerated into the burlesque: the singular wrought out into the strange and mystical” (597). He goes on to list several examples of stories that adhere to this formula, and Wilt attests that he could have made the list much longer: “Even a casual study of the early nineteenth-century English and American magazines yields hundreds of such tales” (103). So it seems that even as Poe was contemptuous of the writers of these articles—as well as the audiences who ensured their proliferation—he determined to write his own semi-serious stories in a similar vein, only to turn around some time later and poke fun at the style much less subtly in “How to Write a Blackwood Article.” He sums up his motivation later in the letter to White. “To be appreciated,” he writes, “one must be read” (597, all italics are in original). It cannot be concluded, though, that Poe was a sellout who slavishly pandered to the blinkered sensibilities of the reading public—because he never acted slavish to anyone. He grew up the foster son of John Allan, a well-to-do Southern merchant. In the course of his upbringing he somehow, in G.R. Thompson’s words, came to “expect the life of the son of a Virginia gentleman—or, if not quite an aristocrat, the next best to that—the son of a prosperous merchant” (xxi). But by the time Poe was attending the University of Virginia, Allan was growing weary of underwriting the profligate Poe’s excesses, such as his habit of losing enormous sums at gambling tables, and cut him off. His foster mother tried to arrange a reconciliation but Poe was too proud to grovel. He did prevail upon Allan, though, years later to help finance his education at West Point. Unfortunately, he blew this too when he wrote to a creditor explaining that his foster father had not yet sent him the money he needed to pay off the debt, further suggesting that the reason for the delay was that “Mr. A. is not very often sober” (Thompson xxiii). The letter was then enclosed along with a demand for payment sent directly to said Mr. A. Rather than face the humiliation of being dismissed from West Point for being unable to pay his expenses, Poe decided to get himself kicked out by disobeying orders. There is even a story—possibly apocryphal—of the cadet showing up in formation naked (Thompson xxxiii).